I’ve been getting more requests from my patients for vegetarian dinner options that contain a good amount of protein. Even for cooking for my own family at home, I like to try out meatless meals on the occasion but I’m always contemplating how to boost the protein content as my workouts consist of lifting heavy weights so the amount of protein I eat is crucial. 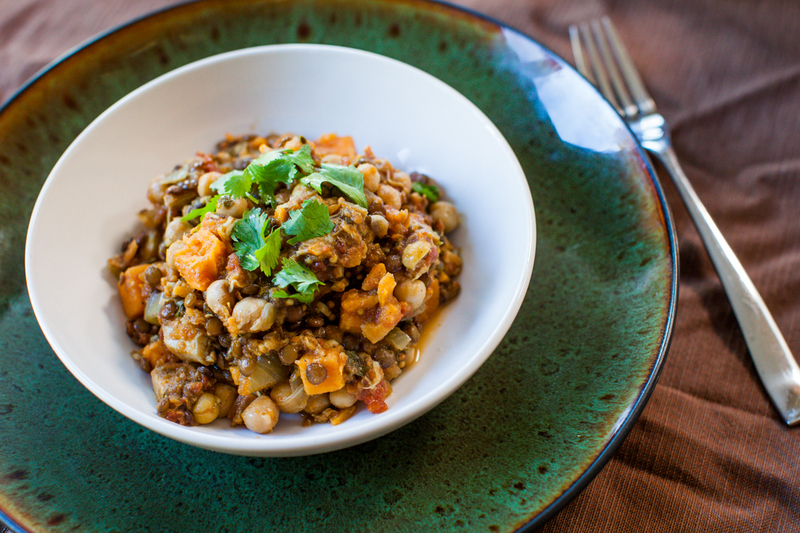 This recipe is a great option for those of you with grain-free or vegetarian diets but also if you just want to try out a hearty meatless option for a weeknight meal. Alternately, if you want to up the protein intake even more, add a couple of chopped, roasted chicken breasts near the end of the cooking time. It’s a pretty quick meal to prep and then you can sit back and kick your feet up to let it simmer until the flavours meld together wonderfully. You might find it tastes somewhat bland before you start simmering, but as the sugars in the sweet potato break down and mix with the rest of the ingredients, the sweet and savoury components of this recipe come together really nicely. A note on seasoning: Recipes will usually indicate seasoning as the last step before serving, however I find seasoning with salt with each step throughout the cooking process builds a better flavour in the overall meal. Be careful to season in small amounts if you choose to do this as you may find the finished product to be too salty!